Spring is officially here, which means short sleeves that are soon to be followed by bikinis and tank tops. Thankfully, Jaime Baird, IFBB Bikini Pro and Fitnessrxwomen.com Editor-in-Chief, is helping us tone up for spring and summer with her Tank Top Tone-up workout. It’s time to get armed for summer! “I’ve been experimenting with different fast-paced circuit-style workouts to keep my muscles feeling tight and toned but in less time,” said Jaime. This circuit-style workout focuses on shoulders and arms, and also incorporates legs for added intensity and calorie burn. So not only is the Tank Top Tone-up super efficient for toning the arms and shoulders, but also you can do this workout all in one place, allowing you to get it done quickly. 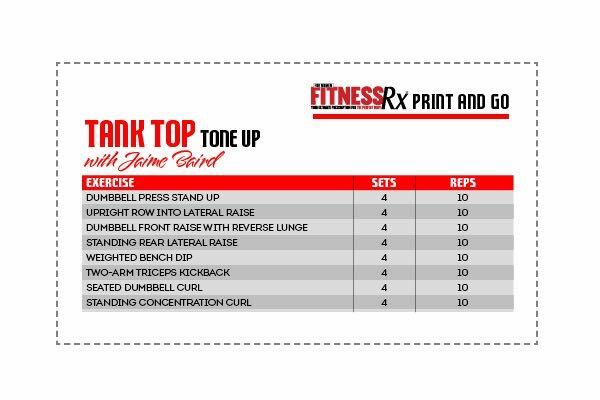 • Perform this circuit style— do one set of 10 reps for an exercise, and then move onto the next one with no rest between exercises. Once you’ve done a set of all the exercises, rest one minute and then start back at the beginning. • All exercises should be done with dumbbells, as this workout is intended to be something that you can do at home or at the gym. • Do this workout two times a week, and doing leg, ab and/or cardio workouts on the other days. Set Up: Begin seated on bench, and hold two dumbbells at your shoulders with your palms facing forward. Work: As you press the dumbbells above your head, stand up. As you lower the weights to the original position, squat down and touch your glutes to the bench (don’t sit all the way down), and then press the dumbbells above your head again while you stand up. Perform upright row then the lateral raise. That is one rep.
Upright Row Set Up: Hold dumbbells and stand with palms facing the front of the thighs. Lateral Raise Set Up: Hold dumbbells in front of thighs after performing upright row, with palms facing each other. Work: Raise arms to the side until the elbows are shoulder height. Keep your pinkies high. Lower and begin another rep by performing another upright row. Set Up: Hold dumbbells and stand with palms facing the front of the thighs. Work: Raise dumbbells forward and up while simultaneously lunging one leg behind you. Bring arms down as you stand up again. Alternate lunges with each rep. Perform 10 front raises (5 lunges each leg). Set up: Hold dumbbells on your sides, palms facing in. Bend knees slighty and bend forward at the waist about 45 degrees or more. Work: Keeping your neck and traps relaxed and without lifting your body, raise arms until elbows are about shoulder height. Make sure to keep your hands wide. Lower and repeat. Set up: Sit on a bench (or, if you are at home, a chair) with your legs extended out in front of you and a dumbbell in your lap. Place your hands on the edge of the bench behind you and lift your glutes up off of the bench. Work: Lower your body by bending your elbows to about a 90 degree angle. You will feel a stretch in your chest or shoulder. Press up from the palms of your hands squeezing the triceps and repeat. Set up: Hold a dumbbell in each hand and bend at the waist, so that your torso is parallel to the floor. Bring elbows up and back so that they are about in line with the shoulders. Work: Keeping your elbows stationary, press your forearm up, straightening the arm. Squeeze the tricep and lower arm back to beginning position. Repeat. Set up: Sit at the end of a bench, with your back upright and straight, and a dumbbell in each hand at your side, palms facing toward the bench. Work: Curl the dumbbells up in front of you. Your palms should be facing you at the top. Lower down and repeat. Set up: Bend over slightly and hold a dumbbell in one hand. Work: Curl the dumbbell up to the shoulder without moving the upper arm or elbow. Lower the weight slowly and repeat.